US foreign policy during the Cold War has been analysed from a number of perspectives, generating large bodies of literature attempting to explain its origins, its development and its conclusion. However, there are still many questions left only partially explained. In large part this is because these accounts restrict themselves to a single level of analysis, either the international system, or the structure of the state and society. The first level of analysis, focusing on the role of individuals, has largely been excluded. This book argues that structural theories, and any approach that limits itself to one level of analysis, are inadequate to explain the development of US foreign policy. Instead, it is necessary to incorporate the first level of analysis in order to bring human agency back and provide a more detailed explanation of US foreign policy. 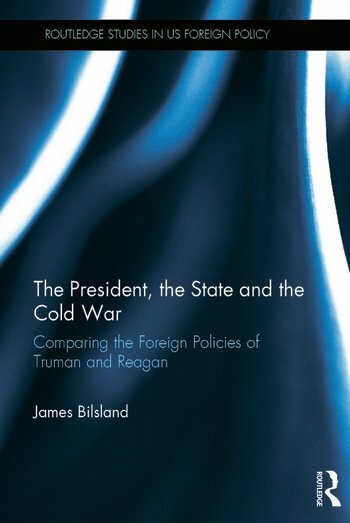 Bilsland proposes an analytical framework which incorporates presidential agency into a multi-level analysis of US foreign policy during the Cold War, constructing a multi-level case study comparison of the foreign policies of Presidents Truman and Reagan. He argues that the worldview of the president is central to agenda setting in US foreign policy making and that the management style of the president influences both decision-making and the implementation of US foreign policy. Evidence to support this is drawn from detailed empirical analysis of Truman’s foreign policy of containment in Korea and Reagan’s foreign policy of rollback in Nicaragua. James Bilsland recently completed his PhD at the University of Glasgow and is currently a member of the School of Geography, Politics and Sociology at Newcastle University.